I never liked stuffed cabbage before, but this recipe is a total winner! Cabbage is mild tasting and is accented by the wasabi-mayonnaise sauce. 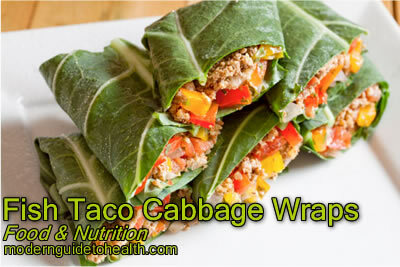 Thanks to this Healthy Recipe Fish Taco Cabbage Wraps. Heat canola oil with dried red chiles in a large, nonstick skillet over medium heat. Cook fish in the hot oil until flesh is opaque and the edges of the fish are slightly browned, about 3 minutes per side. Sprinkle fish with salt and black pepper. Remove from heat, drain, and discard peppers. Stir mayonnaise, wasabi paste, and 2 tablespoons cilantro together in a bowl. Spoon several tablespoons of fish into a cabbage leaf and wrap leaf around fish; repeat with remaining leaves and fish. Garnish each roll with a sprinkling of cilantro. Serve with wasabi mayonnaise.